There is some uncertainty about the market but there are also incentives for buying now. Interest rates are still at historic lows. There is a good initial selection of units across all price ranges, plus motivated sellers. The $8,000 first time buyer tax credit can now also be used as part of a down payment. To qualify for the tax credit, closing must occur before Dec.1 of this year. Plan ahead, keeping in mind that a dedicated search for the most appropriate condo can take time and that financial institutions take months to finalize some deals, after an accepted offer and before closing. 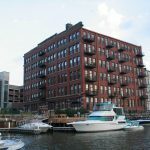 The good deal today is in the Third Ward in a great, cat friendly building right on the Milwaukee River that even includes boat slip and pier access. Just reduced to $194,900, this is a great price for the area, especially considering all the included amenities. 1 BR/1 BA with an open floor plan that includes in-unit laundry, balcony, cream city brick, gas fireplace, granite breakfast bar, whirlpool in BA with slate tile detailing, plus a storage locker. The inside parking space alone adds a $20,000 value in the Third Ward, with rights for potential roof-top expansion included as well.